BlueWave Living is committed to offering person-centred care, with the individual needs and expectations of each resident the central focus for staff. Quality care is provided in a warm, friendly and homely environment with the organisation aiming to develop close relationships with each resident, their family and friends. BlueWave Living offers accommodation for various levels of care, with a range of spacious accommodation options available. Suites at BlueWave Living include bathrooms, quality fittings, natural light throughout, stylish and tasteful décor – providing residents with the highest level of comfort and safety. The well equipped facility common areas such as the dining and lounge rooms offer a comfortable and relaxing environment, allowing interaction with other residents, family and friends. For residents who require ongoing professional nursing and personal care, BlueWave Living offers dedicated High Care accommodation provided by registered nurses, enrolled nurses and qualified care staff. Registered Nurses are on site 24 hours a day, 7 days a week. The High Care resident rooms at BlueWave Living are a combination of single rooms with ensuite and double rooms with ensuites. 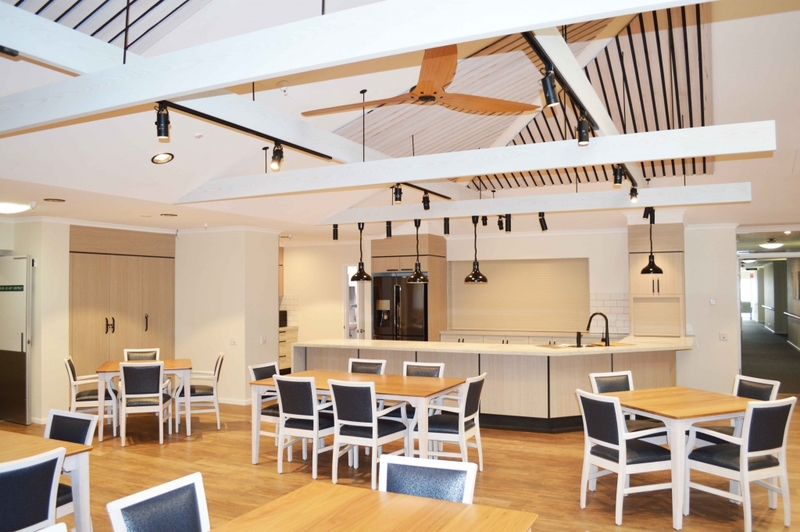 The High Care facility is fully air conditioned and built on one level for easy access. Nestled amongst beautiful landscaped gardens and courtyards, High Care residents are within close proximity to two comfortable lounge rooms, each with their own plasma television and home-like amenities. Meals are cooked freshly on the premises and served in the common dining room or when required, directly to resident’s rooms. 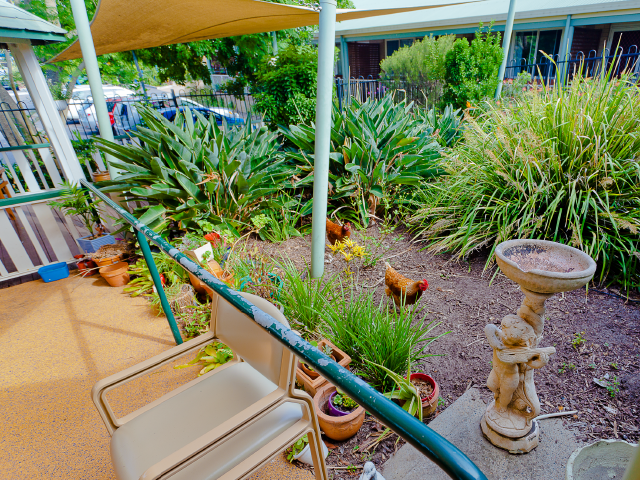 BlueWave Living’s 40-bed Low Care facility aims to provide a well-maintained and home-like environment for residents, supported by carers who can assess and address individual aged care needs. Care is provided to Low Care residents by personal carers who assist with the day to day needs of each individual. Staff including registered nurses are onsite 24 hours a day, 7 days a week, offering quality, assisted living care. The Low Care aged care facility consists of large single rooms, all furnished with a range of quality fixtures including a built in wardrobe, fixed dressing table, drawers and shelving. Each room has its own modern and private ensuite, fitted with handheld showers and rails, along with a skylight for additional natural light. Suites also feature ceiling fans and a centrally controlled heating and cooling system, as well as air conditioning and access to an external patio or verandah. Low Care residents are encouraged to further furnish their own room to ensure it is unique, personal and comfortable. To ensure maximum security and peace of mind, an emergency vital call system is installed throughout the facility, with emergency alarms in both the bathrooms and bedrooms. The Village Square is a common meeting place for residents and visitors and featuring a plasma television and other lounge furnishings. The Village Square leads onto a large picturesque courtyard which is utilised for resident activities including barbeques, concerts and special functions. BlueWave Living offers a range of services for older people who require dementia-specific care. Secure dementia units are located in both the High and Low Care areas at BlueWave Living, providing care for residents with dementia in a secure, familiar and comfortable environment. Residents in the dementia units are provided with specialist care and staff are dedicated to supporting each individual resident to preserve their existing skills and leisure activities. 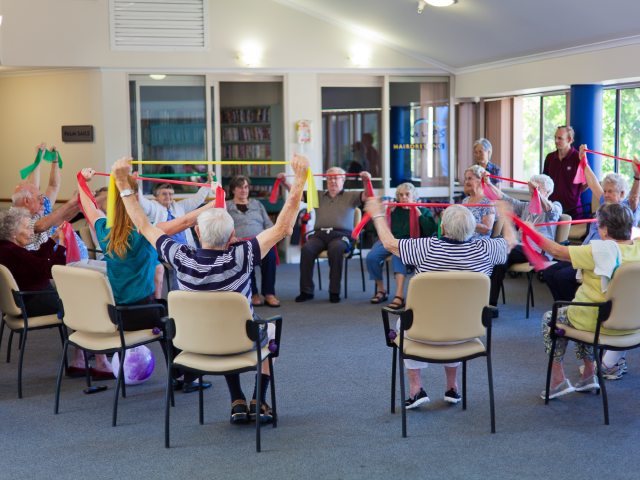 Dementia-specific recreational activities are conducted daily and residents are able to interact with residents, family and friends in the facility common areas. Lounge, dining and living areas are located in close proximity to the residents’ rooms for the enjoyment of residents and their relatives. BlueWave Living offers both high and low level respite care. 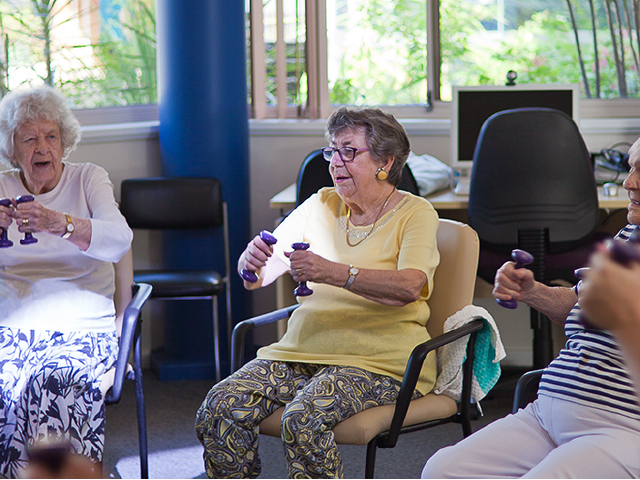 BlueWave Living prides itself on providing a range of therapy services and recreational activities for its residents. Therapy services offered to residents include physiotherapy, aromatherapy, music therapy, massage and podiatry. Social outings, excursions and recreational activities are organised by the dedicated on-site Activity Coordinators. Recreational activities are carried out on a daily basis and include craft, cooking, quizzes, music and gardening. 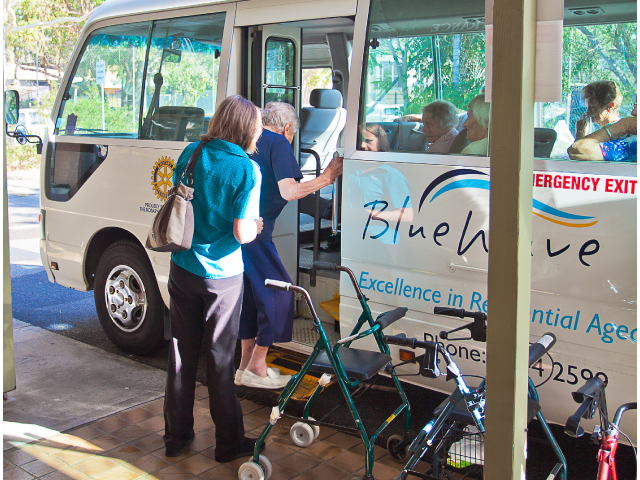 The BlueWave Living bus is used for full and half day resident outings. Residents are also regularly offered the opportunity to enjoy holidays with destinations including Port Stephens and The Blue Mountains, as well as restaurant fine dining and day trips to areas such as the Hunter Valley. Services to promote health and wellbeing are offered with support, encouragement and supervision to BlueWave Living residents.